Yes, he has heard the rumors. And no, he has no intention of taking a job as the President of UConn, a position presently occupied by Susan Herbst, who was startled by the rumor. Herbst was given a salary boost of 24 percent in 2015, which brought her total compensation to $758,000 until her contract expires in 2019, a nifty possible haul for a retiring Democratic governor. Malloy has denied the rumor that he will retire before his term expires, leaving Connecticut’s sinking ship in the hands of Lieutenant Governor Nancy Wyman. The captain is determined to go down with the entire Democratic crew on the burning deck. The political mill must be forgiven for grinding out rumors. Politicians of high caliber usually managed to fall on some soft and expensive pillow when they leave office. In Connecticut, this rule appears to have been suspended temporarily. Former Governor Jodi Rell has retired to a quiet life, far from the political maelstrom, in Florida, a low-tax state governed by Rick Scott, who has made trips to Connecticut trolling for companies who would rather not have their profits diminished by gubernatorial pick-pockets and progressive legislators. State Comptroller Kevin Lembo, perhaps the most promising Democratic gubernatorial candidate, has bowed out of the race, alleging he prefers to be comptroller rather than governor (Cf. Henry Clay, “I’d rather be right than be president.”) The rumor mill has it that Lembo is bowing out because, as comptroller and a faithful party stalwart, he is too implicated in a failing gubernatorial regime to survive as a candidate for governor. Lieutenant Governor Nancy Wyman appears to be waiting in the wings for the baton to be passed to her, but her dallying in announcing for governor is troubling, and appearances may be deceiving. Like Rell, she has had an unblemished political background and is of retirement age. A politically care-free life in Florida beckons. The palm fronds moving in a soft sea breeze, the beaming sun in the sunshine state – even the state’s motto: “In God we trust – may prove irresistible for battle-scarred Connecticut politicians. Connecticut’s motto, emblazoned on the state’s flag, “Qui transtulit sustinet (Who transplanted still sustains), has, over the last fifty years of Democratic hegemony, lost its luster. No one is sustaining the tax paying working class in Connecticut anymore. The state is a horrid but not yet hopeless mess, the “Pimlico” of New England. 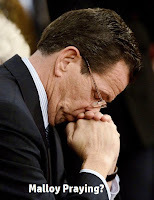 Connecticut’s present condition is neatly summed up in a Facebook post written by State Rep. Gail Lavielle, whose powers of concision are enviable: “This is important for everyone. By approving the state union agreement in July, the legislature effectively signed up with the governor to leave the state nowhere to go except to the towns to close the nearly $4 billion gaping budget deficit. This is, of course, an indirect local property tax increase. The Speaker's recent proposal to raise taxes directly by about $2 billion has a huge built-in flaw: the state can't even collect the taxes it already imposes. The truly needy? They'll be asked to give up services too. The whole situation is unconscionable and did not need to be this way. The governor and the legislative majority are now arguing about whether to tell you they're taxing you more or to pretend they're not and do it anyway."